Posted by Editor at 8:04 PM . 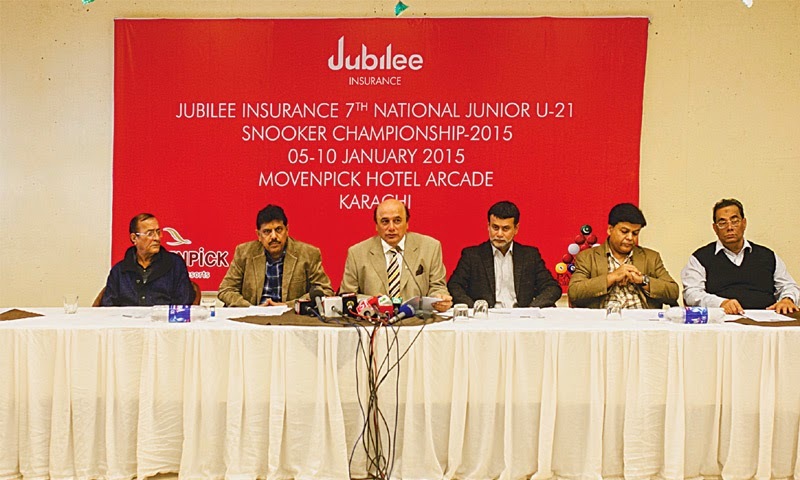 Quite a few newcomers will be trying their luck in the seventh edition of the Jubilee Insurance National Junior (Under-21) Snooker Championship 2015 which cues off at the Movenpick Hotel in Karachi on January 5. According to the draws released by the Pakistan Billiards & Snooker Association (PBSA), the 30 participating cueists, representing all the four provinces and the federal capital, have been divided in eight groups. The Group A comprises of Abdul Rahim (Punjab), Khushi Mohammad (Balochistan) and Sanaullah Sattar (Sindh) while the Group B contains Ali Zaman Khan (Sindh), Junaid Babar (KPK) and Haris Tahir (Punjab). The quartet of Ahsan Wakeel (KPK), Mohammad Ibrahim (Balochistan), Sameer Khan (Sindh) and Mohammad Ali (Punjab) constitute the Group C while Nouman Iqbal (Islamabad), Hazratullah (KPK), Mohammad Afzal (Punjab) and Junaid Ali (Sindh) feature in the Group D.
The Group E is composed of Taimoor Aftab (Balochistan), Sameer-ul-Hassan (Sindh), Mohammad Azam (KPK) and Mohammad Saqib (Punjab) while the Group F has the presence of Fahad Khan (Sindh), Saifullah (Punjab), Athar Ali (Balochistan) and Umar Javed (KPK). Mohammad Fahim (Punjab), Mohammad Hassan Anwar (Islamabad), Tanvir Baloch (Sindh) and Rabi-ul-Hasan (Balochistan) have been drawn in the Group G while Mohammad Kashif (KPK), Mohammad Adil (Balochistan), Aamir Tariq (Punjab) and Gawish Khan (Sindh) are included in the Group H.
The qualifying round matches will be best-of-five frame encounters while the pre-quarter-finals and the quarter-finals will be best-of-seven frame contests. The semifinals will be best-of-nine frame fixtures while the final will be best-of-11 frame clash. The league matches, starting on January 5, will be spread over three days at the end of which the top two cueists from each groups will be qualifying for the knockout stage of the competition, starting with the pre-quarter-finals on January 8 The six-day event will be concluding with the final and the prize distribution ceremony on January 10. The championship, being sponsored by the Jubilee Insurance Group, offers prize money of Rs 130,000 with the winner to collect Rs 50,000 and the runner-up to get Rs 25,000. The losing semifinalists will be receiving Rs 15,000 each and the losing quarter-finalists will be compensated with Rs 5,000 each. The highest break award will earn a purse of Rs 5,000. The PBSA has declared that both the finalists of the event will qualify to represent the country in the Asian Under-21 Championship 2015 to be staged in China in April, as well as in the World Under-21 Championship to be held in the second half of the year. The PBSA, pursuant to its policy of encouraging the promising youngsters, has also decided to let the four semifinalists of the National Junior Championship to compete in the all the four national ranking tournaments of the year.